Le Colonial evokes the ambiance of French colonial Vietnam in a lush, romantic setting. The inner courtyard has been transformed into an oasis featuring mosaic-like tile flooring, a vaulted, pressed-tin ceiling, tropical plants and plush rattan furniture, all accented by the glow of candlelight. 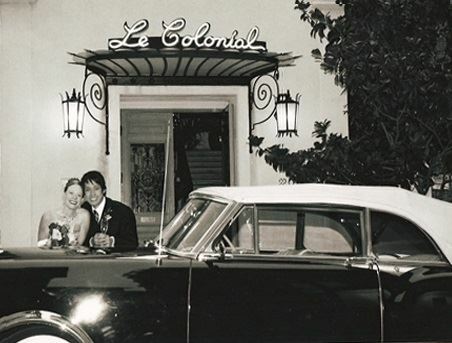 Le Colonial is available for private parties such as weddings, receptions and anniversary or birthday celebrations as well as for corporate events or business dinners. We welcome the opportunity to work with you to create the ideal setting for your special event, and offer full support in providing entertainment, audio visual equipment and floral arrangements. The Package includes: Cold Dishes • Goi Du Du Tom Nuong • Goi Ga • Xa Lach Rau Tron Hot Dishes • Ca Ri Tom • Ga Roti Xao Xa • Ca Hoi Nuong Side Dishes • Xu Bruxelles • Dau Dua Xao • Com Chien Le Colonial Please review our attachment for more options. The Package includes: • Served Family Style • Optional Soup First Course (choice of one) • Appetizers (choice of three) • Main Courses (choice of three) • Side Dishes (choice of one) • Chef’s Dessert Platter To Share Please review our attachment for more options. The Package includes: • Served Family Style • Optional Soup First Course (choice of one) • Appetizers (choice of four) • Main Courses (choice of three) • Side Dishes (choice of two) • Chef’s Dessert Platter To Share Please review our attachment for more options. The Package includes: • Chicken Skewers • Cha Gio Chay • Bo Bia Chay • Goi Cuan • Tofu Cakes • Sweet Potato Wonton • Nori Rolls Please review our attachment for more options. The Package includes: • Served Family Style • Soup (choice of one) • Appetizers (choice of four) • Main Courses (choice of three) • Side Dishes (choice of two) • Chef’s Dessert Platter To Share Please review our attachment for more options. The lounge, located on the second level of the restaurant, features a long mahogany (full) bar, comfortable rattan couches and low wooden coffee tables, continues the decorative theme and is available to be rented in its entirety or in sections. The space is ideal for featuring live entertainment such as a band or DJ. The whole lounge or a smaller section can be rented.